As I Lay Dying have always been identified as a Christian band, in large part due to Lambesis' open faith. However, as our various sources and Deputy Dist. Atty. Claudia Grasso have reported, several months ago, Lambesis had sent his wife an email telling her that he no longer loved her or believed in God, providing further evidence of his recent noted personality changes. His wife had also learned that he had had several extra-marital affairs, she said. According to the DA, an audio recording of the transaction between Lambesis and the undercover detective exists and will reportedly come out in the trial. A preliminary court date has been set for July 10. A CBS correspondent at the scene is reporting that Lambesis entered a plea of not guilty at the arraignment and “Prosecutors say [he] gave [the] undercover agent cash wife's pics gate code dates of when to kill her.” The frontman had allegedly directed the detective he believed to be a hit man to kill his wife while he was with his children so he would have an alibi. Lambesis' bandmates, reps from management and Metal Blade Records along with band attorney Ian Friedman were in attendance, our source reports. View a photo from the court appearance, below. According to Meggan, Lambesis had become obsessed with body-building, indulged financially in cars and tattoos and had become “unavailable for the children,” between touring and weight-lifting. Our thoughts right now are with Tim, his family, and with everyone else affected by this terrible situation – and with our fans, whom we love and draw strength from. AP can confirm from a police report that Lambesis was booked yesterday and his court date is set for 1:30 p.m. PT tomorrow, May 9. He is being held at the Vista Detention Facility and is ineligible for bail or release at this time. A full statment from San Diego County Sheriff's Department spokeswoman Jan Caldwell can be heard via the video from Artisan News, below. “He is charged with Solicitation Of Another To Commit Murder. Information came to us late last week,last Thursday, to be specific , that Lambesis was soliciting another individual to kill his estranged wife, who also resides in the area. So, what's next for authorities? Lambesis' official charge is Solicitation of Another to Commit Murder, according to the San Diego Police Department, who say they were tipped off to the frontman's plans late last week and acted quickly to foil the plot with the help of an undercover detective. According to Billboard, Lambesis' wife, Meggan, the target of his plans, had filed for divorce last September. Metal Blade Records have told us that they have no official comment on the arrest. 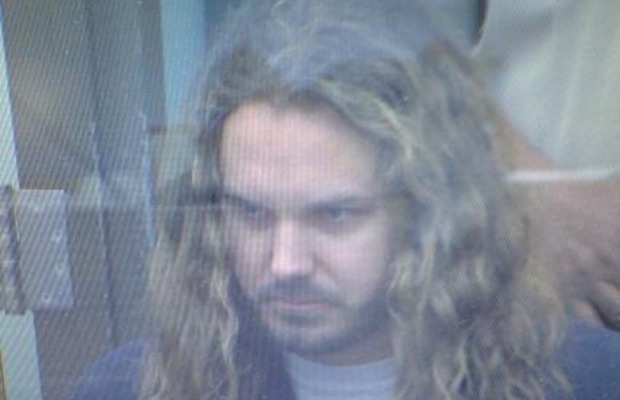 Reuters reports that Lambesis was allegedly caught soliciting an undercover detective to carry out the murder.